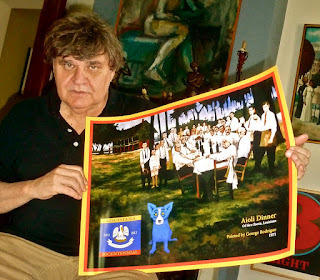 George Rodrigue painted the Aioli Dinner in 1971 based on photographs of a gourmet dinner club, the Creole Gourmet Society. This was his first painting with people, and during the six months that he painted their portraits and a landscape on this single canvas, he developed a style uniquely his own and recognizable today, forty years later, as Rodrigue. In honor of Louisiana’s bicentennial year, 2012, George Rodrigue offers for sale a special version of the Aioli Dinner, his first $100 retail reproduction since his Jazz Fest posters of the late 1990s. To create the print, he photographed a re-worked version (1992) of his Aioli Dinner, increasing contrasts and highlights, resulting in a higher quality reproduction than his earlier posters of the same image. 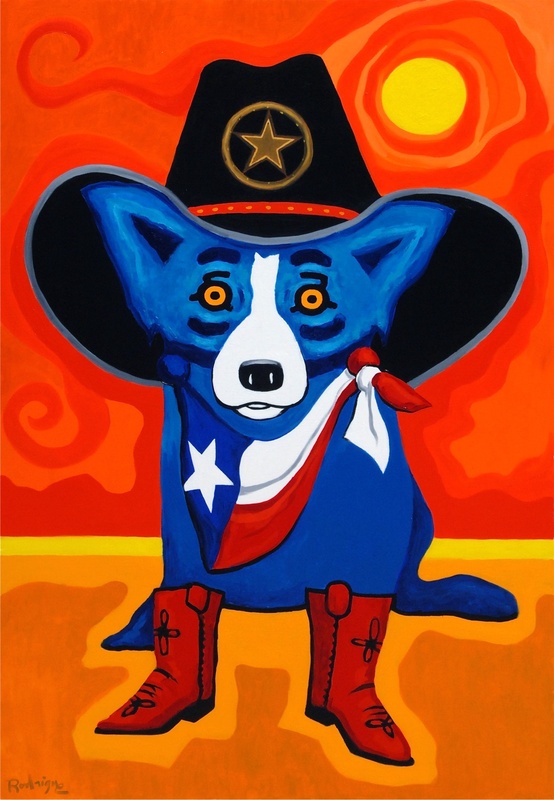 He also adds the Blue Dog, rooted in a Louisiana legend, an important shape and icon within his work of the past twenty-five years. 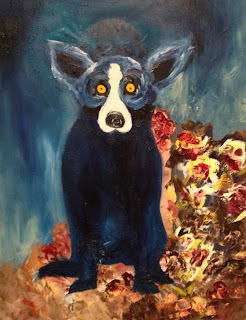 Both the Blue Dog and the Aioli Dinner suggest a melding of Louisiana’s traditions with its contemporary art, a blend that also describes Rodrigue himself. 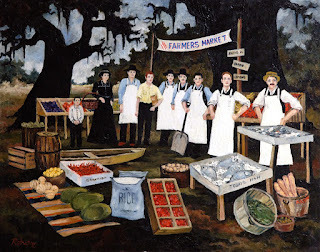 “This early 1900s influx of various European cultures greatly influenced my hometown of New Iberia and, by extension, my paintings of Cajun folk life. My mother (born 1905) often spoke of the various ethnic markets offering everything from pasta to bratwurst." Both the Creole Gourmet Society and Aioli Dinner have rich histories, including specifics of Rodrigue’s style development. Rather than repeat those details here, I direct you to the post “The Aioli Dinner and a Cajun Artist,” which includes photographs, diagrams and vignettes surrounding Rodrigue’s most famous Cajun work. 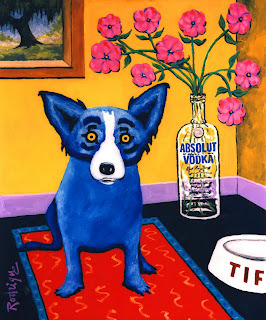 The post also includes the 1992 re-worked version of the painting, a canvas George kept for himself after adding the Blue Dog and nicknaming it Eat, Drink and Forget the Blues. 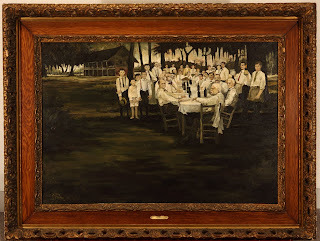 Most exciting, the original Aioli Dinner of 1971 finds a new home this year at The Ogden Museum of Southern Art in New Orleans, where it hangs on loan beginning May 10th, 2012. 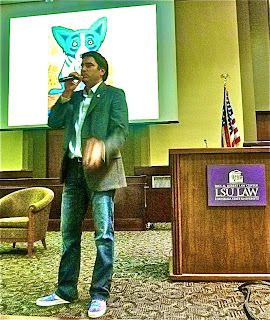 That evening Rodrigue shares the history of his painting during a special public event (5:00 p.m., $10 admission). 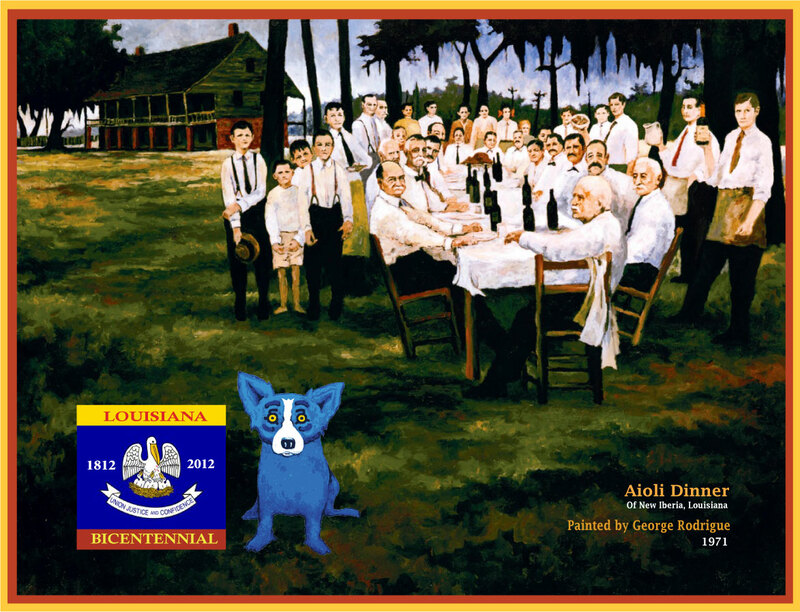 Finally, I leave you with a full version of Rodrigue’s Bicentennial Poster (18x24 inches; click photo to enlarge), combining the Blue Dog and early Louisiana in a celebratory design. Available beginning today,* this commemorative print represents one artist’s Louisiana homage, a tribute honoring the state he loves. I’ve loved libraries from the time I was a kid. During the mid-1970s I worked at the library at New Heights Elementary School in Fort Walton Beach, Florida for extra credit, and it was there that I discovered James Michener and, at age ten, read Hawaii, a book that shocked me to my young, innocent core, but that told me what books could be, beyond my childhood favorites, Nancy Drew and Trumpeter of the Swan. Libraries are a different world in the digital age. As a blogger, I’m stunned when I think of the reference materials at my fingertips, compared to the hours I spent in college in front of microfilm and within the stacks. Although research is faster today, in some ways the experience is similar, as I search quietly through this frontier-like screen, rather than pour through books, piled on the floor around my cross-legged seat in the back corner of a quiet library (an experience I enjoy recreating, actually, within my office). Instead, libraries are “sense-makers,” writes library architect Maria Lorena Lehman, “a dynamic center for idea interaction.” They attract not only book-lovers, but also information-lovers. A librarian provides research assistance and an alternate viewpoint. Within a library, we surround ourselves with voices and knowledge, as appealing today as it was to Cleopatra some 2,000 years ago, as she studied papyrus scrolls. ...however I argue that libraries, like many things, are merely changing. Like the increasing appeal of independent bookstores, once thought nearly extinct, libraries nurture not only our passion for knowledge, but also our sentimentality. Through lectures, children’s events and other programming, they engage and stimulate our communities. With their very presence, they provide brain food and promote cultural dialogue, crossing all generations. 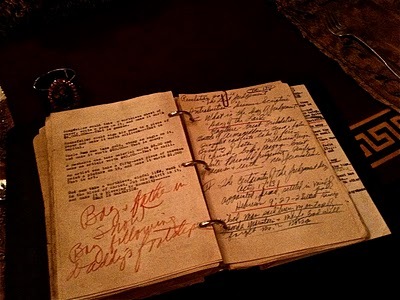 During last year’s exhibition at The Morgan Library, "The Diary: Three Centuries of Private Lives," I thought about not only changes in libraries, but also the apparent death of cursive. Will our grandchildren understand Marie Courrege Rodrigue’s handwriting, saved within her diary and letters in my keepsake box? Will they read the "Declaration of Independence" without a typed translation? My well-meaning and generous sister gave me a Kindle two months ago, and so far I’ve downloaded one book, John Steinbeck’s East of Eden, a reading experiment I’ve yet to begin, although the leather-covered, lightweight computer-book traveled already twice across the country within my carry-on bag (where it remains, awaiting the next trip). Instead I’m just finishing the biography of Edith Piaf (1915-1963), a gift from my equally generous and bookish friend Emer, a first edition protected from the elements and my hand lotion by one of the clear plastic covers stored flat behind my bookshelves. She was named Piaf by her agent, a man who guided her for only a few short months before he was shot in the eye and killed by gangsters. 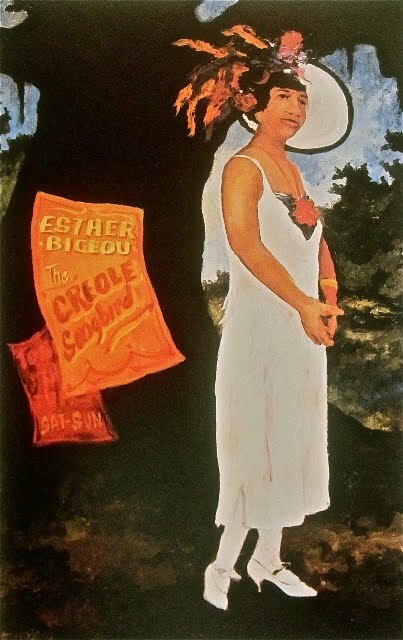 The word "piaf" in French means "sparrow," and the reference reminds me of a painting of Esther Bigeou, the Creole Songbird, by George Rodrigue (1989; click photo to enlarge-). Twenty-two years ago I moved from New Orleans to Carmel-by-the-Sea, an easy decision even for a gal with little knowledge of California beyond The Grapes of Wrath (hardly a ringing endorsement). In the tiny artist’s village I grew, over time, a little less naïve, facing the controversy naturally attached to an art gallery full of blue dogs amidst art galleries full of seascapes, garden paths and feathery children. That was the early 1990s. 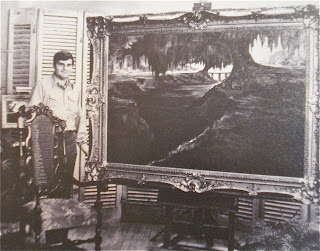 People thought George Rodrigue was crazy for abandoning his Cajun paintings, and they thought I was crazy for thinking him brilliant. In those days, I spent seven days a week, oftentimes ten or more hours a day, in Rodrigue’s gallery, because the rush of witnessing shock followed by acceptance was like no other. I loved the art but barely knew the artist, and so I defended without defensiveness. Without realizing it, I expected everyone, whether they liked it or not, to appreciate this artwork or, at the very least, to be kind. Instead, the naysayers grew louder and the criticism harsher, oftentimes to my face, as though now I wasn’t just crazy for thinking him brilliant; I was crazy for thinking this art. No one embraced this mindset more than those familiar with George’s Cajun paintings (see the links under "Cajuns" to the right of this post). I explained softly, fearfully, that I am the boss and the price is firm. The man stormed out, dragging his wife, in my mind’s eye, along the floor by her hair. I was so shaken that I closed the gallery and took a walk. My youth and the flighty-blonde look that had/has been mine all of my life (no doubt aggravated by the hot pink skort suit and black go-go boots) were my worst assets during these times, as I struggled to be myself, that person who drew people into wondrous conversations about art, versus the accepted notion of a business woman, that person who remains unsmiling, navy skirt below the knee, and talks art-speak or, worse, art-as-investment. Unlike my then-co-workers in New Orleans, I was unable to “ask for the sale” (a textbook technique, according to the numerous sales manuals pushed by George’s then-agent); rather, I talked and listened regarding the art. Without any concentrated sales push on my part, people dreamed about the paintings, discussed the art with friends over dinner, and returned the next day to buy. No question: this is a testament to the quality and sincerity within George’s artwork, as are the returning clients, the people who paid, for example, $6500 for a painting in 1993 and not only still love their painting and resist selling, but often add to their collection at $65,000 for the same size today. As happens in life, I grew attached to the artist as much as the art, and I fought internally, as I do today, an increasing and unwitting defensiveness. It was fine if people didn’t like George’s paintings, but their anger, despite this pattern in the history of art, confounded me. Why visit the gallery if you hate the art?, I recall asking one woman after her tirade. Fortunately, these incidents, although vivid, are rare over the years. Most people, I believe, do avoid galleries (or museums or websites) carrying work they dislike. Just as George enjoys these challenges within his work, I still feel a rush, in the same way I did all those years ago, in sharing his art with others. However, today I choose blogging and public speaking over sales, visiting the galleries merely to share by request with school or group tours. It’s a safer way to go, because unlike the early days, when I didn’t know him personally, today he’s my husband. My exercises in avoiding defensive behavior get enough practice in our everyday lives without facing a tyrannical Rodrigue-hater who just can’t pass the gallery door without voicing their opinion. As usually happens, the hair on my neck raised, fortunately to a lesser degree than in the past. Following a deep breath and a slow walk around the room, I returned to our table and, fearful of my tone in response to her comments, asked instead, with genuine interest, about her recent travels and family. If you were lucky enough to see the Rodrigue retrospective exhibitions in 2007 in Memphis and 2008 in New Orleans, then you know the power of such shows. For those who sought the Blue Dog, the Cajuns and Portraits piqued their interest, as they learned of Rodrigue’s twenty-five year pre-Blue Dog career for the first time. And for those who came for Rodrigue’s earliest years and darkest landscapes, the bright Blue Dog canvases held, to their surprise, the same rich quality. 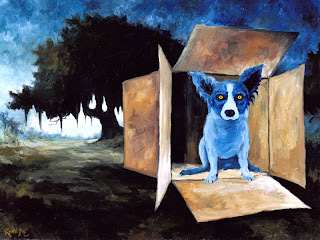 In the near future we combine Rodrigue’s paintings, both from his archives and borrowed from collectors, in new large-scale exhibitions in Texas and California at the Amarillo Museum of Art (opening August 2012) and the National Steinbeck Center (opening October 2013). In addition to borrowed paintings, Rodrigue works at his easel inspired by these shows. His latest canvas, for example, anticipates our upcoming visit to one of his favorite states. In Louisiana, the New Orleans Museum of Art (NOMA) recently completed an eighteen-month statewide tour of their Rodrigue collection in exhibitions ultimately spanning 40-90 works each at museums in Baton Rouge, Alexandria, Monroe, Shreveport, Slidell and Lake Charles (see the links under “Rodrigue in Louisiana” to the right of this post for highlights from those exhibitions). This tour was so successful that it spawned unplanned stops, occurring now. 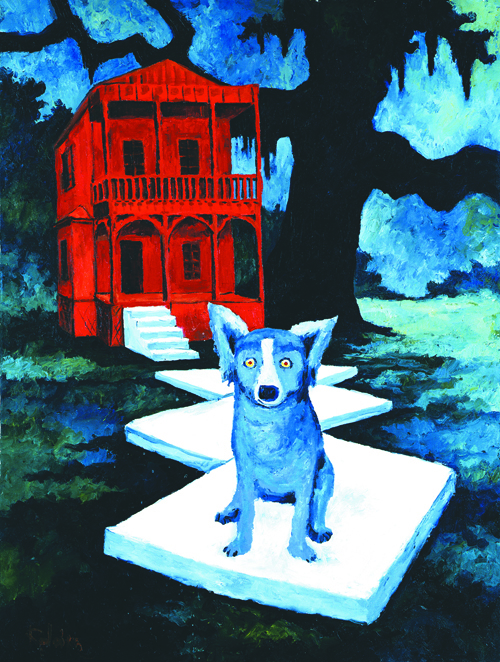 The Hammond Regional Arts Center hosts Blue Dog paintings from NOMA’s collection through April 28, 2012, and the West Baton Rouge Museum hosts Rodrigue’s Saga of the Acadians through June 24, 2012. The Museum at Texas A&M University opens George Rodrigue: Paintings from the New Orleans Museum of Art, September 1st thru November 3rd, 2012 (details here). 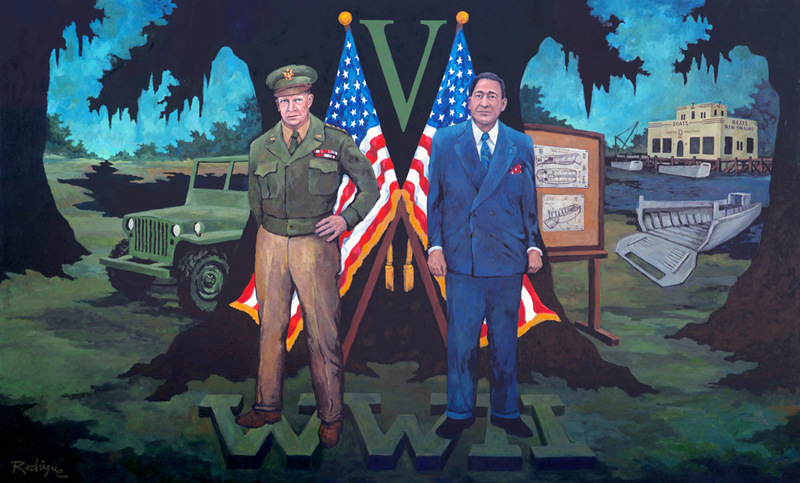 And the Louisiana State Library in Baton Rouge exhibits this fall Rodrigue's Flora Levy Series, portraits of ten scholars, including Pulitzer and Nobel Prize winners, painted during the 1980s for the University of Louisiana at Lafayette (details and images here). Finally, in addition to solo exhibitions, Rodrigue’s paintings hang in numerous American museums and often within group shows. Two of his paintings tour with the Absolut Art Collection in Europe, soon settling permanently in Sweden at the new Historical Museum of Wine and Spirits. 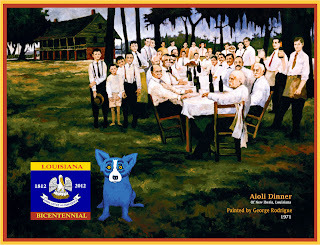 Here in Louisiana, the Ogden Museum of Southern Art unveils May 10th, 2012 George Rodrigue’s most important Cajun painting, the Aioli Dinner (1971). At the opening reception* the artist shares the story of this gourmet dinner club, his first painting with people, which remains on view long-term at the Ogden, third floor. 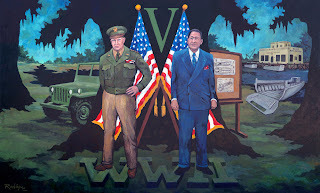 Also in New Orleans, the National World War II Museum exhibits within its permanent collection Rodrigue's Victory on Bayou St. John, a large scale (12 feet) historical painting of General Eisenhower and boat builder Andrew Higgins, commissioned in 2008 by the museum. 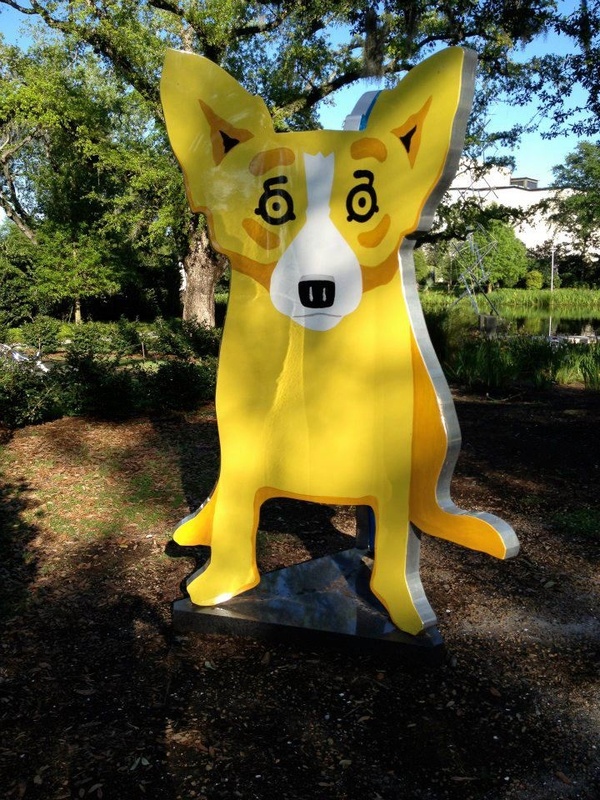 At the New Orleans Museum of Art, while their Rodrigue paintings remain on tour, his Blue Dog statue stands permanently among the massive oaks and other fine works of art in the Sydney and Walda Besthoff Sculpture Garden adjacent to the museum. 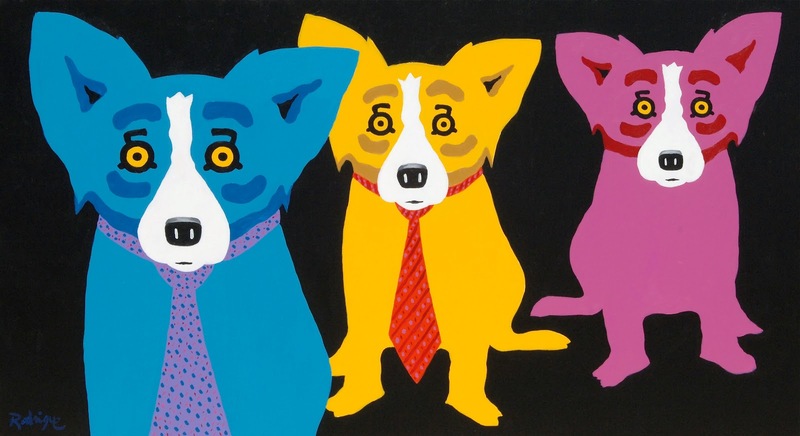 Finally, George Rodrigue’s museum participation is not limited to his own paintings. Recently, for example, he sponsored through the George Rodrigue Foundation of the Arts a video production of “Hard Truths: The Art of Thornton Dial,”* featuring interviews and reactions from O. Perry Walker High School students within the NOMA exhibition. I leave you with this inspiring video, reminding us of the power of the Arts and the importance of supporting them within our community. Guest blog entry by Jacques Rodrigue, George Rodrigue’s son. He currently serves as House Counsel for Rodrigue Studio and Executive Director of the George Rodrigue Foundation of the Arts. He is a graduate of Tulane Law School in New Orleans. Greetings everyone! Jacques Rodrigue here. Wendy is taking a much-deserved break this week from blogging while on vacation. So, I volunteered to fill in and do a guest blog entry! Last Wednesday, the Louisiana State University Law School’s Intellectual Property Law Association invited me to give a guest lecture. I spoke to about 100 law students about how we use U.S. Copyright Law to stop people from illegally copying my dad’s artwork. So, what am I going to blog about today? Well, Wendy always does such a great job giving a great “artistic” perspective of what we do. Now, this seems like the perfect time to recap my lecture and let you know about one of the “legal” sides of our business. Protecting copyrights is a very important task that we all deal with on a daily basis. Don’t worry guys, I am not going to drown you all in legalese, however my dad’s artwork does bring up many unique and interesting legal issues that everyone should enjoy. First, I made it a point to trace my dad’s entire life in my lecture from growing up in New Iberia, going to art school in Los Angeles, then coming back to Louisiana to visually interpret the history of the Cajuns and finally the origins of the Blue Dog and where the Blue Dog is today. I wanted these aspiring intellectual property lawyers to understand that all of their future clients (artists, musicians, writers and filmmakers) have an equally important and interesting story. They all have a “life’s work” that they don’t want others to copy because artists don’t want anyone else to wrongfully profit from their creations or harm the integrity of what they originally made. However, oftentimes artists are intimidated by a confusing legal system and they don’t know what their rights are. Therefore, it is the attorney that must vigilantly protect the artist’s rights so that the artist has a “peace of mind” knowing that the fruits of their labor are safe. In fact, that is why we have all intellectual property law. It is to provide the right incentives for creative people to put their new ideas on paper so that all of society can benefit from what no one has ever seen and what has never existed before. So, that is what I do. I protect my dad’s intellectual property rights so he doesn't have to worry about the past. He is able to fully focus on the future in order to take the Blue Dog on an artistic journey that has never been done before. Additionally, I have a duty to protect the investments that all of our clients have made in our artwork that we sell. They have to know that the market value of their silkscreens and paintings will not be diminished by the illegal acts of others. For example, if we would let anyone make t-shirts and fake paintings the market would be flooded with cheap Blue Dog images. 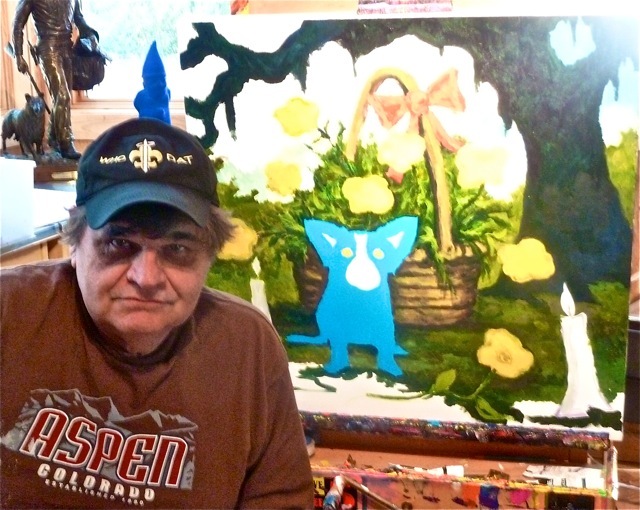 Consequently, clients would no longer see the value in the rare prints and one-of-a-kind paintings bought directly from George Rodrigue. 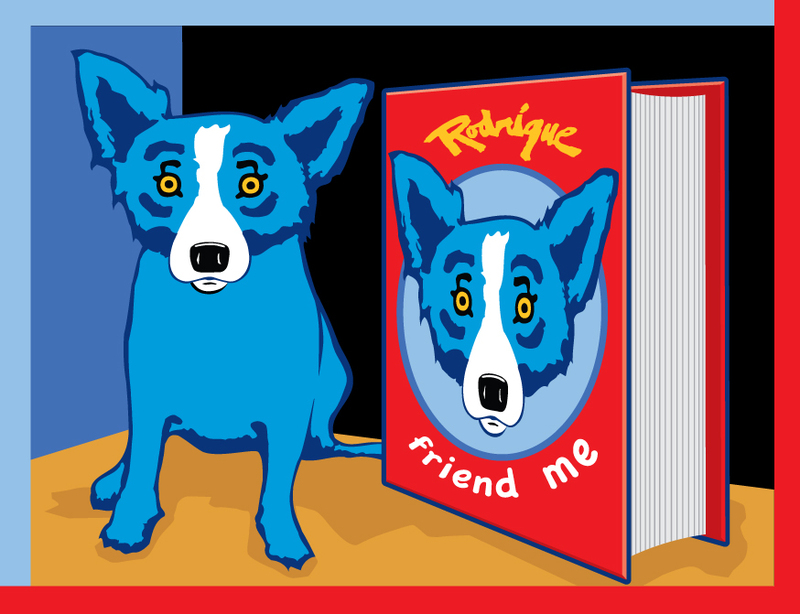 As you may know, Wendy has said that we don’t license the Blue Dog image. There are no Blue Dog t-shirts, products, lunch boxes, or cartoons. 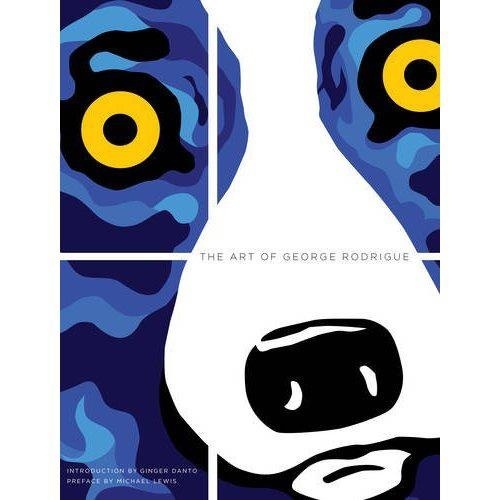 Our only true mass produced item are our nearly 15 books that serve to spread my dad’s artwork to a wider audience in what we think is the “right” way (like our newest revised and updated “The Art of George Rodrigue” new in paperback for 2012). People from around the world email or call every week for a licensing deal. Oftentimes, they think that with their idea they will be doing us a favor by licensing the Blue Dog for use on their product. 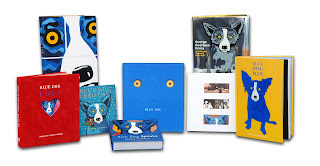 They think the extra publicity of the Blue Dog being associated with their brands will make our artwork more valuable. However, our view is quite the contrary. Though perhaps one day when his artistic legacy is solidified we may entertain other licensing agreements, for now, my dad’s images and artwork are unmistakably his own. If we jumped at every partnership that came along we would run the risk of cheapening what my dad has spent his entire career creating. That is why we rarely partner with other entities unless the project really feels right (like with Xerox and Absolut Vodka). But, what can we really protect? 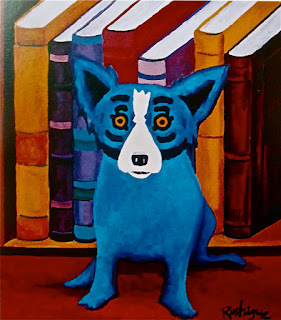 Basically, anyone can paint their own blue dog and we can only stop people from making a "Blue Dog" that looks “substantially similar” to George Rodrigue's Blue Dog. In other words, would the average person think that another person’s blue (or green or yellow) dog looks like it is a copy of ours? To do that, you would look at the specific outline of the shape of the dog, the eyes, the nose, the mouth, the interior of the ears, the color etc. In practice, this is actually a pretty easy test for us. We know almost immediately if something is an illegal copy or not. So, when we see an illegal copy out there, we seize it, destroy it, and if it was sold, we collect whatever profits that were made. Also, important to note is that we actually find out about most copyright infringement from our clients and fans. They are an army of eyes scanning the market that want to either protect their own investments in our work or are just big supporters of artists' rights. We can’t thank all them enough for being our eyes and ears out there! That finally brings us to the fun part that people are interested in seeing. We then looked at a few examples of infringement over the years. One issue that we deal with constantly are pages cut out of our books** and framed to look like prints that we sell in the gallery. For now, this is our most important issue that we stop anytime that we see in flea markets and on eBay. These pieces are essentially worthless, yet people pay $30 to over $100 for them because they think they are real hand-signed prints that look big when matted and/or framed. In actuality, they are just printed pictures of signed paintings that have no value. We have taken down literally hundreds of eBay listings and seized thousands of these matted pages over the years. Thankfully, when we seek to seize these items, whoever made them hands them over without a fight and eBay is also great to take down illegal listings almost immediately. Next, I touched on the high profile case of when miniature cows were illegally made depicting the Blue Dog image. Originally, my dad made a life-size cow for the Chicago Cow parade and some of their organizers sold miniature cows across the country in Hallmark stores without permission. My dad eventually seized the illegal cows and used them in a display at the New Orleans Museum of Art (full story here). Also, there are plenty of outright fake paintings that we find around the country. 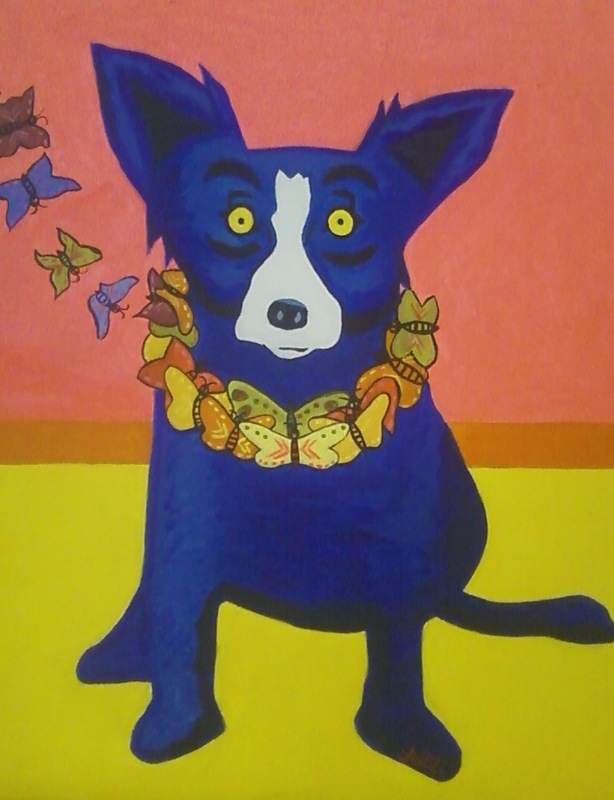 Rarely, a person is actually painting their own Blue Dog copies and trying to make a profit themselves. 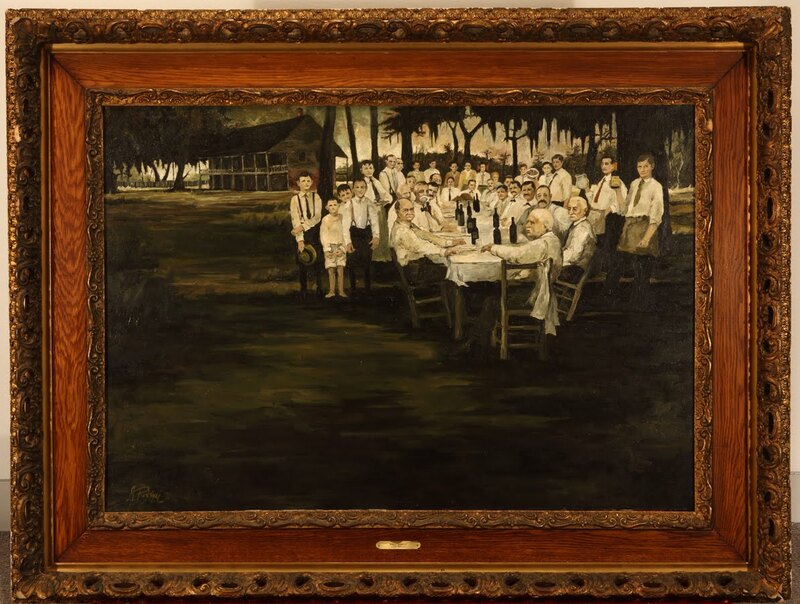 More commonly, someone unknowingly buys one of these paintings at a thrift store or estate sale and tries to resell them (two of many examples below). Unfortunately, most times, I have to tell them that Grandma had an illegal painting (like the fake "Blue Suede Shoes" below) and what you have has no value. In addition, you can’t sell it and I need to take it from you because we can't allow fakes to exist in the marketplace. Finally, the last thing I touched on in my lecture was some very scary infringement. A few years ago, we found a Chinese website that claimed they could paint any Blue Dog painting ever made for about $100. After doing some research, we learned that there are in fact a few villages in China that are full of artists who can copy any painting to sell across the world. This is scary because oftentimes the Chinese government does not usually recognize foreign intellectual property rights. Luckily, in this case, the website was hosted by an internet service provider owned by Google and we were able to get Google to shut the site down. However, it is pretty scary to not have any idea how many fakes are circulating in China. All in all, I think the lecture went very well. The students seemed really engaged by the things I had to say and show them. Plus, this lecture got me to organize my thoughts for what I had to do the next day. On Thursday, I served as resident “expert” for the History Channel’s reality show “Cajun Pawn Stars” filmed in Alexandria, Louisiana. 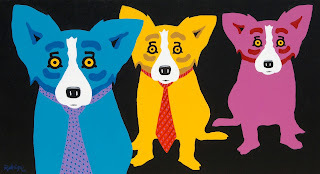 I can’t reveal too much about the show that airs this summer, but I had to evaluate a Blue Dog print that someone was trying to sell in the shop. In my appearance I got to say something that most of these experts on similar reality shows both can’t say and don’t have the authority to say when they evaluate a piece’s authenticity. The producers there really liked having this extra wrinkle in the story. Just another day in the life of a copyright enforcer . . . Thanks for letting me be your guest blogger this week! I hope now everyone has a new appreciation for the importance of copyright enforcement. Because ultimately, if we did not diligently enforce our rights we would be at risk of losing the protections granted to us by Copyright Law. **Please note the difference between a framed page from a book and a framed note card. Unfortunately, the law does not allow us to seize framed note cards. 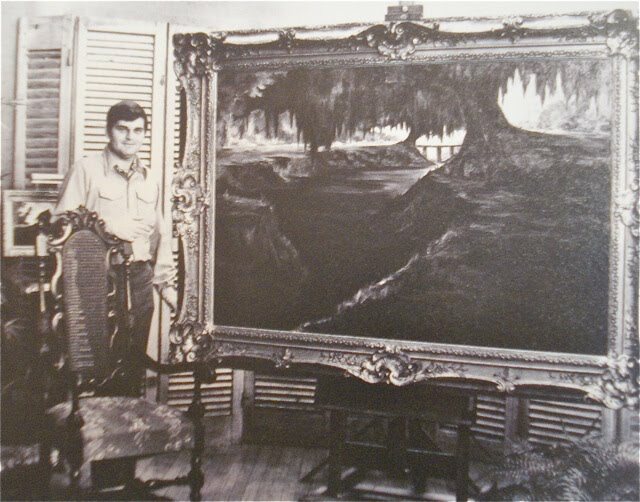 Since the early 1970s George Rodrigue set out to preserve on his canvas Louisiana’s Cajun heritage. 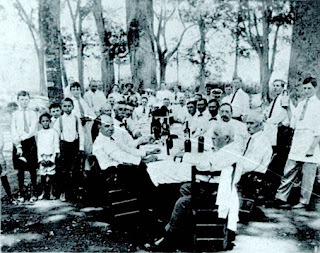 Following his return to New Iberia from art school in Los Angeles, he noticed dramatic changes in the southwest parishes, and he feared that the Cajuns, his people, faded quickly as a distinct culture within America. Growing up, he remembers residents traveling by horse and buggy in towns like Carencro, Erath, Scott, and other areas around Lafayette, shopping at small town grocery stores. But by the mid-1960s he saw only cars. Using symbolism, Rodrigue painted his people without connection to time. 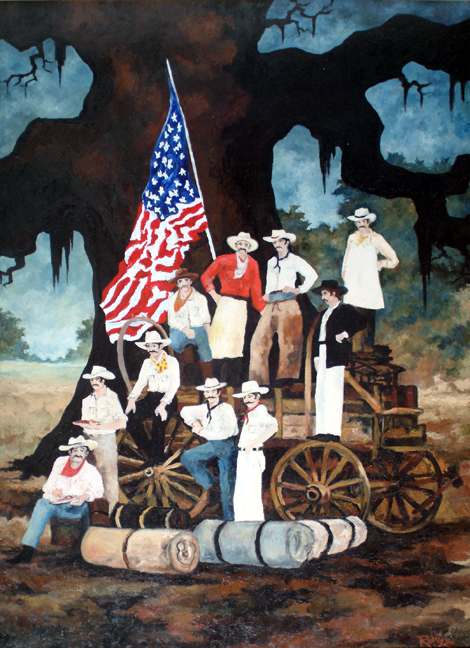 His Louisiana oak tree, pushed to the front of his canvas, protects and frames his figures, trapping them within a pre-modernized culture. Instead of standing in shadow, the Cajuns glow with an interior light, timeless symbols of days and customs forever gone. In Farmer’s Market (1984, oil on canvas), for example, farmers and fishermen offer their fresh produce and seafood beneath the trees in pre-grocery store Acadiana. 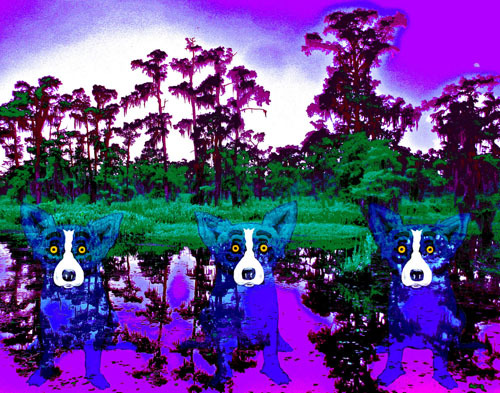 The figures stand framed by the background, locked into bushes and oaks, unable to move without destroying Rodrigue’s complex, specific design. 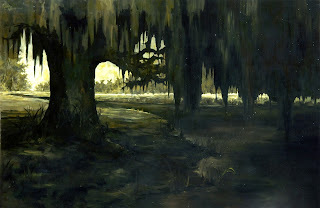 The Cajuns become part of a puzzle, pieced together with strong positive shapes formed between and beneath the trees, defining not only a canvas world, but also a slice of Louisiana. “I tried to capture the Cajun people in their home life, workspace, hunting and fishing, and their participation in fairs and festivals throughout the small towns. Nobody else was doing that --- not from the region, nor outside of it.” – G.R. In many of his Cajun paintings, such as the Aioli Dinner and the Mamou Riding Academy, Rodrigue began with early photographs, designing Louisiana’s landscape around the figures. (Click on the painting titles above to see those images and photos-). However, in Farmer’s Market he fabricated a scene entirely from his imagination, staging friends and family in costumes in the backyard of his Lafayette home and gallery. Finally, it’s interesting to note that George Rodrigue painted his Farmer’s Market the same year he painted his first Blue Dog, an image illustrating a book of Louisiana ghost stories, celebrating the World’s Fair held in New Orleans in 1984. This began many years of Cajun-Blue Dog crossover on Rodrigue’s canvas, as he added this distinct dog-like shape to his Evangelines and Oak Trees, not yet realizing that he too, like his community, would change forever.